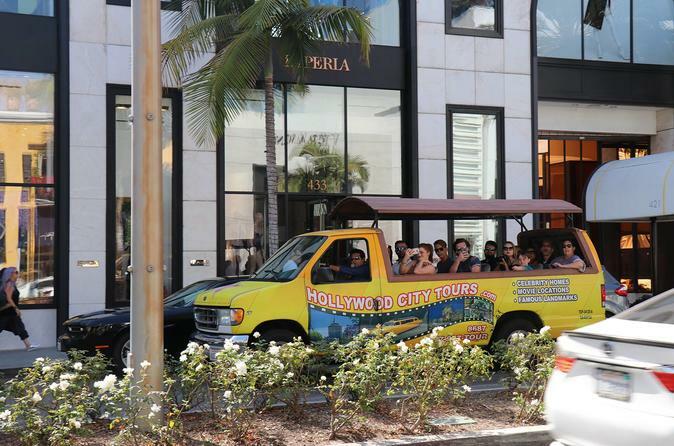 See Hollywood, West Hollywood & Beverly Hills on our Open Air Buses. Experience The World Famous Hollywood Sign, Famous Landmarks, Celebrity Homes & Movie Locations. Hop off to take your photo with the World Famous Hollywood Sign. Visit the places where Celebrity's Live, Work & Play. Bring your camera, celebrities are often spotted on this tour. Hollywood: See the Walk of Fame, Chinese Theatre, Dolby Theatre, Capitol Records, Hollywood & Vine, Pantages Theatre, Hollywood Bowl. West Hollywood: Cruise down the Sunset Strip. See the Whiskey A-Go-Go, The Viper Room, Rainbow Bar, Laugh Factory, Chateu Marmont, The Sky Bar & Comedy Store. Beverly Hills: Drive thru Rodeo DR where the stars shop. See the stores of Prada, Versace, Louis Vuitton, Cartier, Gucci. Take a photo of the Beverly Hills Sign & Beverly Hills Hotel.